Imagine you’re at your local supermarket. The many brand choices of packaged food can be overwhelming, and these products often contain surprisingly high-levels of salt, sugar, saturated fat and kilojoules which may contribute to the risks of heart disease and stroke. How can you decide what to put in your basket and be sure you make the best choices and buy healthier food for you and your family? The FoodSwitch App can help you find out what is in the food you’re eating and suggest healthier alternatives for you and your family. A version of the app for the Fiji and Samoa is in development. Making even small changes to our diets, such as consuming a little less salt and added sugar, and eating less fat (particularly saturated fat) and energy (kilojoules) could prevent many health problems in Hong Kong including high blood pressure, high cholesterol, obesity and type 2 diabetes. This could in turn help reduce the incidence of heart attacks, strokes and some cancers. No matter which filter you’re using, healthier choices are first identified by comparing the overall nutritional value of foods based on the Health Star Rating score algorithm, taking into account a range of different factors important to general health including saturated fat, sugars, salt, energy, protein, dietary fibre, fruit, vegetables, nuts, and legumes (FVNL) content, and for some products, calcium. Add an item to a shopping list, share the information with others, or help us improve the app by reporting any potential issues. Save your healthy favourites on a shopping list ready to make the switch next time you shop. Export your lists or share them with your friends via social media (eg. Facebook, Twitter and email). FoodSwitch is powered by a large, independent packaged food products database for Hong Kong. However, because there are always new products coming on the market and some products are only available in certain areas, not all food products available in Hong Kong are in the database yet. This is why we encourage FoodSwitch users to help us add to the database. Recording product availability across every supermarket in Hong Kong is not possible. 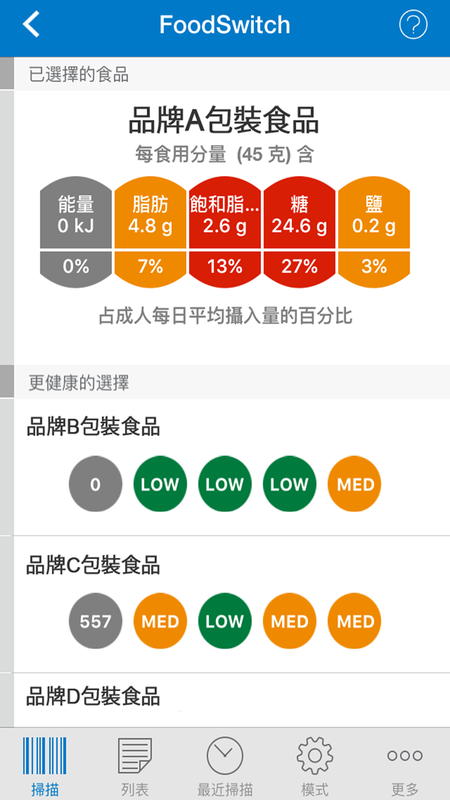 Instead the app lists a number of healthier choices available in Hong Kong for the product scanned. If a healthier product listed is not available then your scanned item is the healthiest available at that location. Why are we using Australian based algorithms and UK based standards? How do we think these are applicable for Hong Kong consumers? Currently, packaged product nutritional information in Hong Kong is mostly restricted to a nutrition information panel. This can be tricky to find, read and interpret, often making it difficult for consumers to be informed and make healthier food choices. In Hong Kong, compulsory food composition labelling on packaged food products needs to include a nutrition label. This is often found on the back of the product in very small print. Studies show that the nutrition label only influences the food purchases of a small minority of people who are very motivated and well informed about how to make healthier food choices. Many studies suggest that front-of-pack (FoP) labelling systems can help consumers interpret the information and make healthier food choices. FoodSwitch is free and available to everyone in Hong Kong who uses an Apple or Android smartphone that supports the FoodSwitch app! Can I use the app outside Hong Kong? FoodSwitch is designed specifically for each country and is different in each country in which it is released. This is because the barcodes on foods are specific to each country. 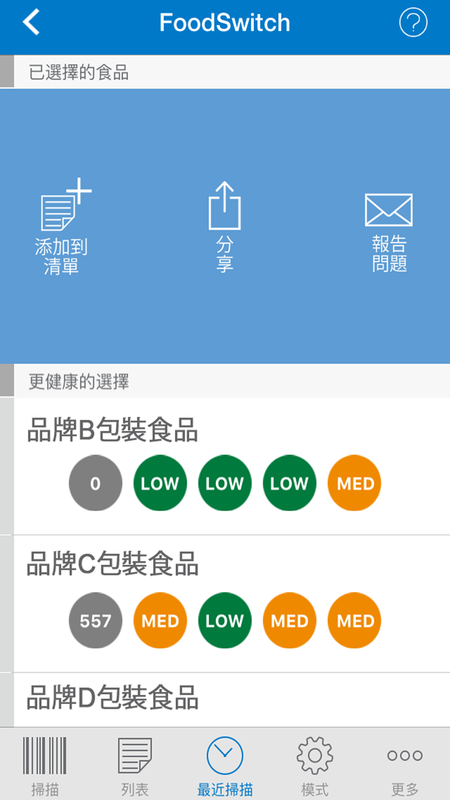 If you use the Hong Kong version of FoodSwitch outside of Hong Kong it will likely give incorrect results. Currently, FoodSwitch is only available in versions for Hong Kong, China, India, Australia, the UK, South Africa and New Zealand.